Kaloba EPs® 7630 is a highly-concentrated root extract from the Pelargonium sidoides grown in South Africa. It has been scientifically and clinically proven in double blind placebo controlled studies with over 10,000 patients (involving adults and children from 1yr) do have the following properties. No other single product sold in NZ has these properties and substantial evidence to support those claims. There is not one single active ingredient, rather a unique combination of several constituents that give Kaloba EPs® 7630 these properties. Kaloba EPs® 7630 has been sold globally to 50 million patients over the past 30 years. The respiratory system (nose, throat, chest, sinuses) is prone to infections. The first signs of a viral infection are; tickle in throat, itchy eyes, sore or aching body, runny nose. Kaloba EPs® 7630 guards against this infection by creating a protective coating film over the mucous membrane. This make it difficult for the viruses to get hold/attach to the cells and thus the viral attack is stopped. 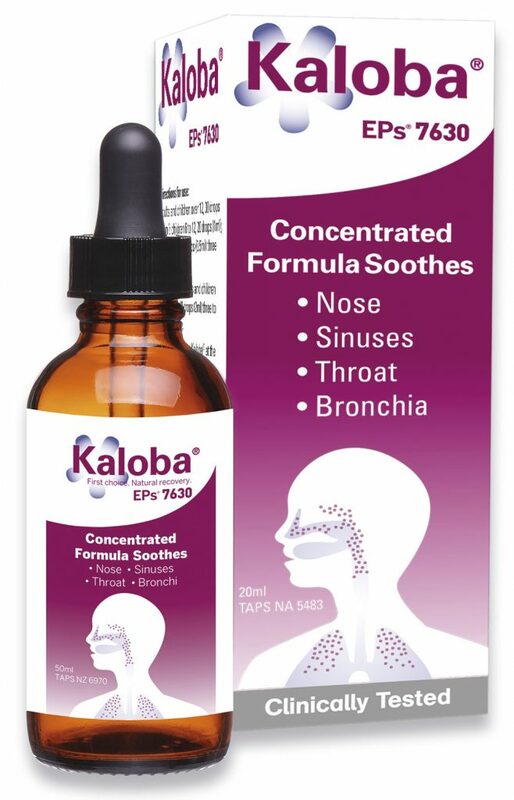 Kaloba EPs® 7630 is also affective after an infection has subsided or when a viral infection turns into a more serious secondary bacterial infection, by reducing the infiltration of new viruses and bacteria. In summary Kaloba EPs® 7630 deals to the root cause of infections and deals to them quickly and efficiently. Who is our target consumer?